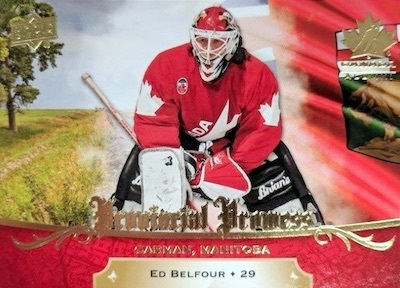 Honoring the past, present and future of the hockey factory in the Great White North, 2018 Upper Deck Team Canada Juniors highlights standouts from the men's and women's national teams. Each Hobby box averages four hits, which is same as the 2017 edition. At least one autograph patch is expected per box. 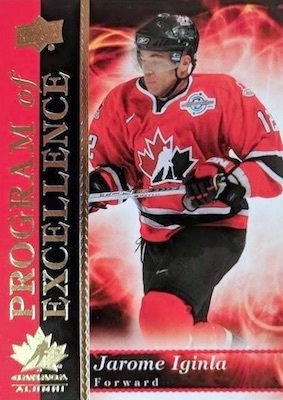 The 100-card base set contains key prospect names from the men's U-18 and U-20 squads, as well as notable alumni and top subjects from the women's team. Combining to average five per box, parallels include Exclusives (#/225) and High Gloss (#/25). 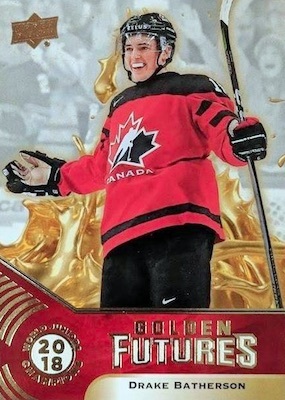 The 2018 Upper Deck Team Canada Juniors checklist also offers all-new inserts in the form of Golden Futures (1:24 packs), celebrating the gold medal win at the 2018 World Junior Championship, and Provincial Prowess (1:8 packs), with region-specific designs. The UD staple Program of Excellence (1:4 packs) is an option, as well. 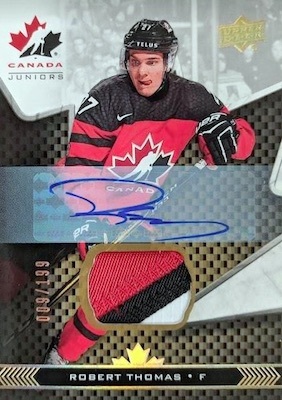 Each box should deliver four hits and those breaking 2018 Upper Deck Team Canada Juniors Hockey can look forward to Team Canada Premium Swatch Autographs in either Tier 1 (#/125) or Tier 2 (#/199) rarity. 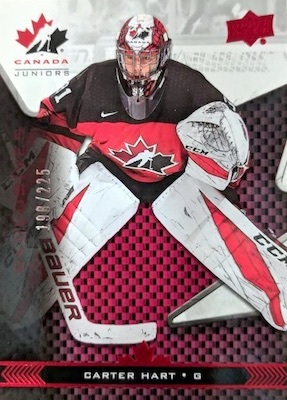 There are also the Team Canada Women’s Premium Swatch Autograph cards, numbered to 199. Other possible hits include Team Canada Jersey (1:8 packs) or the base Black Autograph (#/5) parallel. 2017-18 Upper Deck Team Canada Juniors Black Pierre-Luc Dubois Auto #8 1 5 ssp!! PARALLEL CARDS: Exclusives #/225, High Gloss #/25. 86 cards. Serial numbered #/5. 62 cards. Shop autographs on eBay. 21st is a Tuesday. Is this really the correct release date? I saw on other websites 12th of September. That’s the date that was initially supplied. Nearly every UD set has changed release dates lately. 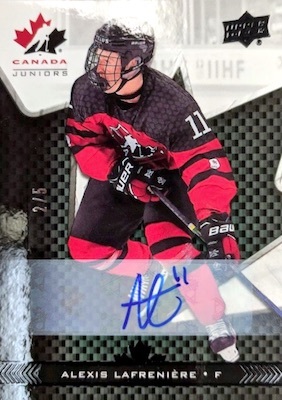 I really like this product but it has a few minor issues, firstly the collect ability of some of the hits, unfortunately people are interested in future NHL stars and being such their is little value or interest in hits that feature a woman from team Canada (sorry to say it). 2nd quality control of this product, I just opened random packs from the local shop but every second card seems to have bad corners or poor centering, I have an auto patch where the sticker is peeling up. 3rd the price good golly 13$CDN a pack. I finished the patch autos set for a rather reasonable price. 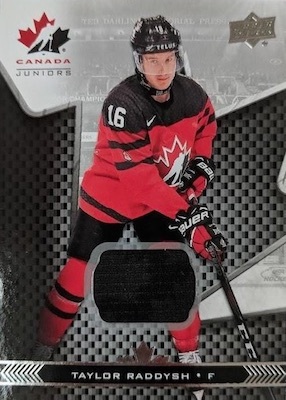 Good looking cards, with the odd “Canada” tag mixed in there instead of just a jersey patch. Also scored one of the Hart black autos /5. Decent value at the price for a box. Go Canada! They have to be bought through comc_consignment…in which are selling on ebay..
Upper Deck are shooting themselves in the foot…because they are going to customers like me …& that’s thousands & thousands of dollars .. Being from the Great North, I love this set!! I’m not to concerned about the Black auto’s, I’d rather a Patch auto.